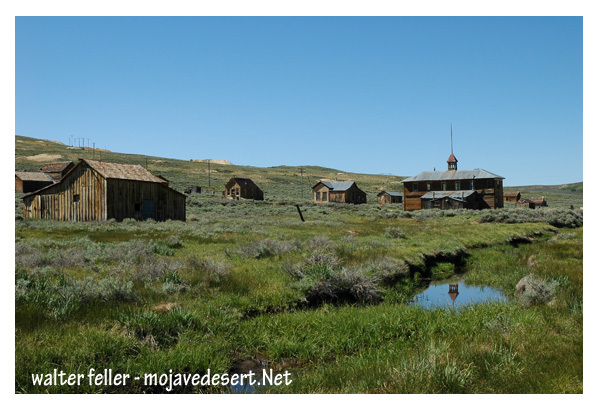 Bodie is a ghost town. Today it looks much the same as it did over 50 years ago when the last residents left. To preserve the ghost town atmosphere, there are no commercial facilities at Bodie, such as food or gasoline. There is a bookstore inside the museum where you may also inquire about daily tours. Restrooms (flush toilets) are located at the parking lot and the picnic area. Everything in Bodie is part of the historic scene and is fully protected. NOTHING may be collected or removed from the park. Metal detectors are not allowed. For public protection, certain unstable sections of the park are posted as prohibited areas, and are closed to entry by park visitors. There is no camping at Bodie. Contact U.S. Forest Service or Bureau of Land Management offices for nearby camping information. Bodie ghost town on the eastern slope of the Sierra Nevada mountain range in Mono County, California, United States, about 75 miles (120 km) southeast of Lake Tahoe, at an elevation of 8369 feet (2550 m). Gold was discovered in 1859 by prospector Wakeman S. Bodey, who the town was named after. Bodey died in November making a supply trip and becoming stranded in a blizzard. In 1876, the Standard Company discovered a profitable deposit of gold transformed Bodie from an isolated mining camp of few prospectors to a boomtown. Bodie was famous for its lawlessness. At its peak in 1880, it had 60 saloons. Murders, brawls, and stagecoach holdups were constant occurrences. Legend has it that a little girl, upon finding out that her family was moving there, prayed one night, "Goodbye God, I am going to Bodie." Gold bullion from the town's nine stamp mills was shipped to Carson City, Nevada accompanied by armed guards. Once the bullion reached Carson City, it was sent by rail to the San Francisco mint. In 1893 the Standard Company built its own hydroelectric plant, located approximately 13 miles away on Green Creek, above Bridgeport, California. The plant developed a maximum of 130 horsepower and 6,600 volts alternating current to power the company's 20-stamp mill. This pioneering installation was one of the first times an electric motor was operated over long-distance power lines. Bodie's Chinatown, had several hundred Chinese residents at one point. The Chinese workers earned their incomes mainly from selling vegetables, operating laundries, and cutting, hauling, and selling firewood. Winter temperatures in Bodie would often fall well below zero, and winds reaching nearly 100 miles per hour would sweep across the high open valley. Large amounts of firewood were needed to keep residents warm through the long winters. Many ill-prepared towns folk perished during the extremely harsh winter of 1878-1879. The Standard Mill is the largest and most well preserved examples of an ore processing plant used during the period. 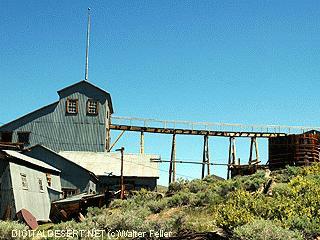 For an explanation of how a stamp mill operated, see the Stamp Mill in detail page.